This page addresses challenges Tuvalu faces regarding size, accessibility, economic infrastructure, and topography; explains the uniquely severe and detrimental effects that climate change has and will continue to have on Tuvalu; and introduces the path Tuvalu has taken to draft climate change policies in keeping with its national strategies for sustainable development. Tuvalu is the fourth smallest nation and second smallest developing nation in the world. The country commands a landmass of 26 square kilometers, and, according to the 2002 census, a population of 9,561 people live on the nine islands that constitute the country. Although Tuvalu’s landmass is extremely small, the nine islands that make up Tuvalu are spread over 900,000 square kilometers of the western Pacific, which suggests the problems of inter-island transportation and communication encountered in the nation because the country’s extremely small population is dispersed over a large area. Additionally, Funafuti, which is the capital of Tuvalu, contains 58% of Tuvalu’s total population or 4,492 people, whereas the second most populous island, Vaitupu, contains only 16.5% of the population or 1,591 people. Consequently, although Tuvalu is a small country with a limited population, the people of Tuvalu are often separated from each other by wide stretches of sea, and, whereas the capital is facing problems of overpopulation and even over-development, the other eight islands constituting Tuvalu are exposed to slowed development and manpower shortages. Inter-island transportation among Funafuti and the outer eight islands of Tuvalu is provided by inter-island boat services, but several hours or days are required to travel among the islands and conditions are frequently marked by discomfort and seasickness. International transportation also proves extremely challenging. Direct flights to Tuvalu are available only from the nation of Fiji and depart only twice a week, which leads to substantial backlog and waiting lists during busier travel seasons such as the summer. Furthermore, due to the small size of Tuvalu’s one international airport, the largest plane that can land in Tuvalu only seats approximately 40 people, which exacerbates problems of securing transportation between Tuvalu and other nations. From a communications standpoint, because Funafuti is the capital of Tuvalu, the majority of the nation’s administrative offices are located in the Funafuti atoll. Funafuti possesses regular telephone service and maintains its connection to Tuvalu’s other eight islands via postal services and radiophone. However, although Internet services have been available in Tuvalu since 1999, accessing the Internet remains difficult for the average citizen, with Internet cafes supplying Internet facilities for the majority of the population and only government offices possessing more stable Internet connections. Consequently, aside from its small size both in terms of population and landmass, Tuvalu also encounters numerous difficulties regarding accessibility to transportation and communication services, which substantially affects Tuvaluans’ access to citizens on islands other than their own, as well as their access to the international community. Naturally, this phenomenon also influences the goods and services available to Tuvalu, restricting access to products that may be easily located in other countries. Largely due to the issues of size and accessibility described above, Tuvalu’s economy has been slow to develop and is small, fragmented, and highly vulnerable to external economic influences. As a result, the government and people of Tuvalu have established several innovative strategies to increase revenues. For example, the government has developed the Tuvalu Maritime Training Institute to train young men to work as seafarers on foreign ships, which has allowed these men to generate income that can be transferred to their families in Tuvalu via remittances. Tuvalu has also successfully marketed not only its national stamps and coins, but also its Internet domain name suffix “.tv,” which created substantial revenue during the late 1990s because “tv” is the shortened form of the English word “television.” Additionally, although Tuvalu’s landmass is limited, its sea territories are quite vast. Thus, Tuvalu also utilizes the annual sale of fishing licenses to foreign vessels as a means of amassing annual revenue. Finally, with the assistance of diplomatic allies and international organizations, Tuvalu's central and local government bodies have established two trust funds, that is, the Tuvalu Trust Fund and the Falekaupule Trust Fund, to bolster Tuvalu’s national budget as well as the operations of Tuvalu’s eight outer islands. Despite these innovative actions on the part of the government, however, Tuvalu possesses few exports and no land-based natural resources, and semi-subsistence farming and fishing are its primary economic activities. Unfortunately, because the nine islands constituting Tuvalu are composed of infertile and low-quality soil and no fresh water aquifers exist, farming activities can only be conducted on a limited basis. Consequently, Tuvalu is heavily reliant on imports and outside development assistance to ensure the well-being of the local people, and, because of accessibility problems, although Tuvalu possesses spectacular scenery and pristine beaches, an average of fewer than 1,000 tourists visit Tuvalu annually. Although the topics discussed above illustrate challenges that have influenced Tuvalu’s national development and can explain why climate change might present a more unique and severe challenge to Tuvalu than to many other countries, topography most clearly demonstrates the dire threat climate change, and sea level rise in particular, poses to Tuvalu. The major topographical characteristic of Tuvalu is that all of the land belonging to the nation is “low-lying.” This means that no mountains occur naturally in Tuvalu and that all of Tuvalu’s islands are less than five meters above mean sea level. However, it is imperative to note that, although some areas in Tuvalu reach four or five meters above sea level, the majority of the population lives less than one meter above sea level, bringing Tuvaluan citizens into direct contact with the ocean almost every day of their lives. In addition to this and as mentioned earlier, the landmass of Tuvalu is exceedingly limited and each of the nine islands constituting Tuvalu are extremely narrow. For example, the population of Fongafale, Funafuti, where nearly half of the country’s population is concentrated, is on average less than 100 meters wide, making it extremely vulnerable to inundation from sea level rise. As a result, sea level rise is a direct threat to the lives, assets, and ecosystems of Tuvalu, and the sea level need only increase one meter to displace the majority of citizens from their homes. The problem of Tuvalu’s topography and the threat of sea level rise to the low-lying land of Tuvalu has been further exacerbated by the fact that, during World War II, much of the landmass of Tuvalu was excavated and forests and mangroves destroyed when U.S. troops constructed airbases on Funafuti, Nanumea, and Nukufetau. Consequently, Tuvalu is now not only threatened by overland ocean flooding, but sea water has also begun to seep and bubble up from below the islands of Tuvalu, leading to the increased threat of flooding from both above and below. The effects of climate change on Tuvalu became evident beginning in 1950, but, in some cases, these impacts appeared even earlier in the nation’s history. For example, the maximum temperature in Funafuti has increased at a rate of 0.21°C per decade since 1950, which is consistent with patterns for global warming and climate change. Additionally, between 1950 and 2009, rates of relative sea-level rise near Funafuti were approximately three times higher than the global average while ocean acidification levels have been slowly increasing in Tuvalu’s waters since the 18th century. Thus, it is apparent that climate change already affects Tuvalu in terms of increases in temperatures, sea levels, and ocean acidification levels. The most recent report released by the Intergovernmental Panel on Climate Change (IPCC) has further suggested the extreme effects climate change will have on Tuvalu into the future. First, the IPCC report suggests that sea levels will rise in the range of 0.5 meters to one meter by the year 2100. Because Tuvalu’s land territories are all less than five meters above sea level and the majority of Tuvalu’s population lives less than one meter above sea level, if the IPCC’s findings are accurate, the majority of Tuvalu’s populated land will be submerged by 2100. Due to the increased rates of sea level rise, not only will the low-lying areas of Funafuti and other Tuvaluan islands be exposed to more frequent and extensive saltwater flooding, but Tuvalu’s agricultural activities, as well as the already limited water supplies in the country, will also be severely affected. To describe a specific example, Tuvalu once relied heavily on growing pulaka, a type of taro, to maintain agricultural self-sufficiency. Now, due to sea level rise, the swampy areas of islands where pulaka is farmed have increased in salinity and citizens are unable to successfully raise this crop. As a result, the people of Tuvalu can no longer depend on pulaka to replenish their food supplies and are forced to instead import large amounts of rice to sustain their daily diet. The IPCC has also predicted that, due to the effects of climate change, severe weather events will soon begin to threaten Tuvalu with increased frequency. For example, cyclones and droughts will become more commonplace and are some of the first serious effects of climate change Tuvalu will witness in the near term. Unfortunately, the effects of climate change are also presently destroying and will continue to destroy life forms including coral that have, in the past, naturally protected Tuvalu from severe weather events like cyclones. 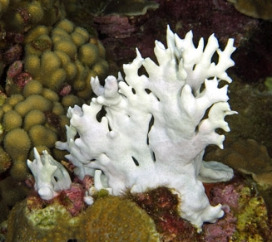 To give an example, increases in water temperature directly result in extreme coral bleaching phenomena, during which marine-life such as algae that grow within coral die out as temperatures reach excessively high levels. As a result, coral turns white—hence the term “coral bleaching”—and if high temperatures persist, the coral itself dies. In addition, ocean acidification is currently threatening coral and shellfish with calcium carbonate components such as clams, mussels, and snails. Ocean acidification is another consequence of climate change, in which high levels of carbon dioxide that now exist in the atmosphere because of greenhouse gas emissions result in higher levels of CO2 being dissolved in the ocean. Higher CO2 levels in the ocean contribute to the increasing acidity of ocean waters and threaten to dissolve the calcium carbonate components of certain marine creatures because CO2-rich habitats make calcium carbonate erode faster than it can grow. Because, in the near future, severe weather events will occur with greater frequency at exactly the same time that naturally protective life forms like coral experience accelerated rates of decay, the destructive force of severe weather events will increase exponentially, threatening both the people and land of Tuvalu. Finally, the Pacific Climate Change Science Program has developed several projections that indicate that average annual air and sea surface temperatures for Tuvalu have been increasing and will continue to increase in the future. Under a high emissions scenario, temperature increases that will occur by 2030 are projected to be in the range of 0.4°C to 1.0°C, and will be accompanied by an increase in the number of hot days and warm nights and a decline in cooler weather. These temperature changes will not only lead to the increased severity of coral bleaching phenomena and affect the protections against severe weather events that coral reefs afford to Tuvalu, but will also reduce agricultural and marine resources, accelerate the evaporation of water from soil, and pose a direct threat to the health of local citizens. Because the above effects of climate change have tremendous implications for the well-being and survival of the Tuvaluan people, Tuvalu has been cited as one of the most vulnerable countries to the influences of climate change and sea level rise. In the face of such an imminent threat, the Government of Tuvalu has currently developed the Te Kaniva Tuvalu Climate Change Policy 2012 and the Tuvalu National Strategic Action Plan for Climate Change and Disaster Risk Management (2012-2016) to combat the various dangers caused by climate change. In formulating these measures, the government has sought not only to ensure that all policies related to climate change dovetail with Tuvalu’s current sustainable development strategy, but has also sought to guarantee that these measures enhance adaptation and mitigation for climate change and address the risks Tuvalu faces as a result of this threat. Tuvalu’s current national strategy for sustainable development, which covers the period from 2005 to 2015, is entitled Te Kakeega II, and was approved by Tuvalu’s Parliament in November of 2005. Environmental issues and strategies for combating climate change are considered crucial to the success of Tuvalu’s sustainable development, and Strategy 11.4 within Te Kakeega II delineates key policy directives regarding the environment and specifically highlights Tuvalu’s initiative to “establish national climate change adaptation and mitigation policies.” In response to this goal, the Government of Tuvalu has developed and promoted the Te Kaniva Tuvalu Climate Change Policy 2012 (TCCP) and the Tuvalu National Strategic Action Plan for Climate Change and Disaster Risk Management (NSAP). These policies are a direct method by which to achieve Te Kakeega II goals and objectives and thereby contribute to Tuvalu’s sustainable development. The TCCP and NSAP were developed using identical methodologies and designed for simultaneous implementation, but were created as separate entities to more clearly highlight the theoretical and practical aspects of Tuvalu’s national response to climate change. Consequently, whereas the TCCP outlines Tuvalu’s vision and sweeping strategic policies for combating climate change over the period extending from 2012 to 2021, the NSAP represents the government’s plan for implementing the TCCP and more practically defines the manner in which the TCCP should be realized in all aspects of Tuvaluan life over the five-year period from 2012 to 2016.